We love our old project truck, and there is a lot there to love. The three-on-the-tree shifter, the traditional cab with the fuel tank behind the seat, a simple dash cluster with big glowing red lights when the oil pressure is too low. And let’s not forget the headlights dimming when the generator speed slows down. It is those little things that make us love this truck. But, there are a couple of things that we’d like to get rid of too. First to go was the four-wheel drum “pump-and-pray” brakes that made us wish for an anchor we could toss overboard. Our next concern is that the fuel economy is just slightly better than an amphibious assault vehicle. FYI: The modern amphibious assault vehicles average about 1.75 mpg on the ground. Actually, we measured the project truck’s mpg at a very conservative 9 mpg in city/highway driving (on its best day). Yeah, we’re not setting any records with that efficiency. The worst part is, the carburetor sitting on top of the old intake is a single barrel Rochester. These were pretty horrible little gas passers from the factory, and they tended to get leaky rather quickly. It didn’t take long to realize that we needed to do something to make this budget project actually live up to its goal. The solution? How about an efficient and modern electronic fuel injection system? You bet, and our friends at FiTech EFI were there to help us figure out how to help our budget with this upgrade. FiTech’s new EFI master kit (Part #31003) includes everything you need to convert to EFI in one neat kit that is retail priced at $994. That’s right, a full EFI conversion for under a grand. How Is This A Budget Upgrade? The 1960 Chevy C20 with a three speed manual was rated to get near 12 mpg when introduced by Chevrolet. Nobody really cared in 1960, because gas was .14-.17 cents a gallon. A round trip to town and back, crossing 50 miles would cost from .58 to .71 cents. That same engine, in today’s worn out state, getting 9 mpg at $3 a gallon, now costs $16 – on the best day. Granted, we are not starting with the best test platform for fuel efficiency, but there is an opportunity to show how these versatile EFI systems can save enough money to pay for themselves. We don’t want to give away the ending of the story, but … we end up getting almost an extra four miles to every gallon of gas we use. With our 20 gallon, behind the seat tank, that represents an extra 80 miles. That’s over 17 bucks saved with each tankful of California winter-blend gasoline. Even if we were are conservative and say that we were able to purchase gasoline at $2.70 a gallon, we are still saving $15.42 on every tankful – and that is a savings that you will feel in the wallet. The system pays for itself in just over 50 tankfuls of petrol. That is how this is considered a budget upgrade. The most amazing part of the increased fuel economy from this upgrade stems from the original factory specs: This truck was released to the market in 1960 with an expected fuel economy of 12 mpg new. Now it’s 56 years later, and we’ve improved upon the original 1960 mpg number by almost two miles-per-gallon – and we did it with a well-worn engine! This was our starting point. A bare-bones 261 cubic-inch Chevy inline six. Typically, the only thing you need to upgrade to EFI is one of these complete EFI conversion kits. We selected the FiTech EFI Master Kit #31003 for economy, ease of installation, and quality of performance. FiTech's Go Street EFI system (Part #30003) features a die-cast throttle body with four injectors. Realizing that not everyone needed a super high-performance EFI system that kept up with wild cams or monster horsepower engines, Ken Farrell set out to make an EFI master kit that would change the fuel efficiency game for the rest of us. Farrell understood there were a large number of enthusiasts that were happy with a factory crate engine or the stock vintage engine that came with their classic car. The attractive throttle body also includes built-in fuel rails, an ECU mounted on the side, Idle Air Control, throttle position sensor, and a fuel pressure regulator. 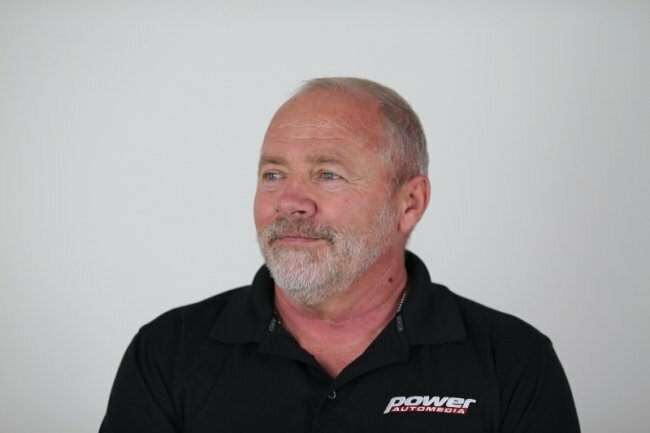 Armed with that knowledge, he set out to design an EFI system with those considerations in mind, achieving a purpose-built fuel system that was flexible enough for almost every application. “There’s no reason to buy a carburetor ever again,” said Farrell. The FiTech EFI master kit comes complete with everything needed to install an EFI system on practically any vehicle, in almost any cylinder configuration. The fuel supply comes in the master kit and is discussed below. An engine with electronic fuel injection has cleaner exhaust emissions, because of the precise and accurate fuel metering. This helps reduce the concentration of toxic combustion byproducts exiting the engine. It may not be the top concern on your list, but if you can improve performance and run cleaner at the same time, isn’t it worth it? The stock 261 cubic-inch Jobmaster Straight Six engine was a low compression, low horsepower engine in a day when fuel economy didn’t mean much. In spite of that, the engine was topped with a single-barrel Rochester carburetor. Unfortunately, the chassis was too heavy to take advantage of the small carb, and this beast suffered from poor fuel efficiency. We were more than a little skeptical when it came to an EFI conversion for our 261 cubic-inch stovebolt Chevy. The engine was well worn, but like most old stovebolts, it simply keeps plugging away. It seemed unlikely that we would be able to save fuel by replacing a single barrel carb with a four-barrel style EFI unit. Removing the oil bath air cleaner and single barrel carb exposed the small intake manifold passage. The intake and exhaust manifolds were designed to bolt together for an exchange of heat from the exhaust gasses to the incoming fuel charge. Because we needed to change the intake manifold to accommodate the larger throttle body, we would need to change the exhaust manifold to an aftermarket version. We almost forgot to mention, fuel injection systems can also operate in any orientation, including upside down. Carburetors with floats are not able operate in extreme orientation or even zero gravity. So our project truck will have that going for it if we decide to execute an inverted roll in flight. Most enthusiasts attempting this installation will have an easy time making the bolt on conversion. Simply pull the old four barrel carb off, bolt on the new EFI unit, make a few electrical connections, plumb in a high pressure fuel pump, and away you go. Because our application is an unusual engine to choose for an EFI upgrade, we had some additional considerations. Once the intake and exhaust were removed, the intake and exhaust ports told the story of a well-used engine. The intake ports were very “wet” and showed signs of a rich mixture. Right away, we knew that the intake was going to be a problem. The old stovebolt came with a cast iron intake that was an airflow nightmare. To make the matter worse, the intake and exhaust manifolds were bolted together for an exchange of exhaust heat to warm up the fuel before it enters the combustion chamber. The single-barrel intake manifold would need to be swapped out for something that could handle the larger EFI unit. Then, the exhaust manifold would have to be changed to a unit that was stand alone. We decided to remove the exhaust manifold locating pin and use a stud or bolt for extra clamping power. After removing the locating pins on the front and back ends of the cylinder head, we blocked the intake and exhaust ports and attacked the mounting face with a wire brush. A good seal is important here. The only game in town when it came to 4-barrel intake manifolds for a Chevy 235/261ci engine is the company that made it’s name in 6-cylinder engine performance: Clifford Performance. Jack Clifford had made a career of making the Mopar Slant-6 engines run like 8-cylinder engines, and his tag line was 6 = 8. Our timing could not have been worse for this project. Jack Clifford had passed away, and the store he operated was long gone. The new manifolds were installed, with some serious metal removal from the intake manifold to make it fit. The FiTech throttle body was a snap to bolt on to the intake, and with a couple of wiring connections, we were ready to run. We managed to find his son-in-law, Larry Milwee, who has kept the business operating from his garage in Wildomar, California. Our first order for the manifold went through with no difficulty, and we installed the unit on our block. It took quite a bit of massaging to make it fit with a set of split exhaust headers that we ordered through a speedshop in Orange County. We are talking some serious grinding and metal removing to make the intake fit – but we did. The heart of FiTech’s Master EFI kit is their time-proven, and very popular, Go-Street throttle body. The throttle body unit mounted up with no difficulty, and the throttle cable connected with ease. The frame-mounted fuel pump system took less than two hours to plumb. Even with the seven wire connections and wire routing, the entire kit – including fuel system – can be installed in a single day without difficulty. We did it in our driveway, so it can easily be done by any home do-it-yourselfer on the weekend. The 50001 Fuel Delivery system includes a 255 L/PH inline, external fuel pump suitable for use with an engine making up to 600 HP. The kit includes high quality EFI grade fuel hose suitable for both inlet and return lines to the fuel tank. EFI grade fuel filters and all necessary fittings and hose ends are also included. We completed the installation only to find that engine RPM was high at idle. It was steady, but high. No matter what we set the target RPM at, the unit would set the RPM around 1,500. We drove the truck around, thinking that the unit would start to adjust once the temperature would get to operating range, but closer inspection of the data showed that we had a vacuum leak. A significant leak too. What we learned from this disaster was that the EFI unit worked so well, that it compensated for a really bad mechanical problem. Fortunately for us, the leak was so bad that it stood out. A smaller leak might have been masked by the EFI unit. That is how well it works. We made a mental note to check the data on the handheld’s dashboard whenever a change is made to the system. The EFI system is self-learning and self-compensating. It will automatically adjust to a mechanical problem, but it will also display every piece of information you need to troubleshoot any problems that arise too. We called the folks at Clifford Performance and soon discovered that we had the wrong intake manifold for our engine. We didn’t have to wait weeks for a replacement, it was a quick trip to Wildomar, California, and 20 minute return back home with the right manifold, which made the experience a little easier. We wound up with a second-generation straight six intake manifold instead of the first-generation version. The second-generation intake manifold was obviously more square, with larger rectangular ports. It's little wonder that we had a vacuum leak. The new first-generation Clifford Performance manifold lined up and fit solidly. It's amazing how much better the correct parts fit. We removed the entire assembly and reinstalled everything, but this time, with the correct intake manifold. Not surprisingly, the unit bolted up much easier, and we were more secure that there was a better seal between the manifold and block. The orientation of the system even seemed better on the correct manifold. This also proved to us that the system could be taken off and reused on another engine if a future upgrade is performed. This EFI system will probably last longer than the engine, or any of the other engine components will – and it is certainly more versatile. The wiring is all color-coded and clearly labeled so that the electrical assembly is even easier than the mechanical assembly. With the old Rochester carb, getting the old beast to start was a matter of pulling the choke out at the right spot, pumping the gas two times, and cranking the starter until the engine started to run on its own. Sometimes this took three or four attempts. We’ve always heard that you shouldn’t have to warm up your engine if the carb is set correctly, but that wasn’t the case with our old truck. You had to warm the engine up or it wouldn’t move without protesting. Holding our breath, we turned the key to see what was going to happen with the new FiTech EFI system. The frame mounted fuel pump began turning as we waited for the system to pressurize. When the pump stopped, we turned the key to start mode. Once we had the correct manifold, the system was reassembled and ready to run. Our fears immediately disappeared as the engine immediately came to life. We checked the handheld controller display to see what the engine data looked like, while the rest of the crew checked for leaks and other problems. The engine was pure silk at idle, and had never run better. Nothing could be easier than using the handheld controller to set up your EFI system to run with your engine. In our case, we had to scroll down the menu to "Write Cal to ECU" and select that option. The default for six cylinder engines is the V6 T195O option. Within a minute, the tune is loaded and the vehicle is ready to start. Running at idle is one thing, running with Southern California traffic is something totally different. The truck is a stock three-on-the-tree shifted transmission with typical 1960s work truck rearend gearing, so it goes through the first two gears pretty quickly to begin with. After the conversion, the first gear was almost not needed as the truck got to speed rapidly. We knew that there was going to be some improvement in throttle response time, but had no idea that it would be that instantaneous. After downloading the tune, the user should fine tune the system by going to the EFI initial setup screen and picking the engine setup option. In this screen, you can check to make sure the number of cylinders and engine size is correct. You can also fine tune the system based on the camshaft profile and even program an RPM rev limit and warm idle speed. Going back to the calibration screen, the user can setup a fan controller and dial in air conditioning controls to maintain a steady idle when the compressor kicks on. Our bare bones work truck had neither of these concerns so we disabled them in the setup. The initial off-throttle coast down numbers showed that we were a little rich as the engine consumed extra fuel getting back down to idle at stops. In less than 20 miles, the system had corrected itself and was optimized throughout the throttle range. The handheld controller dashboard has become an exciting part of our driving now. A supplied windshield mount allows the driver and passengers to watch the engine’s performance while driving. This may be part of the reason that we were able to achieve better fuel economy. Watching the AFR numbers on the gauge in response to different actions almost dares the driver to achieve a higher score. Sorta like playing a video game. Going back to the dashboard screen, the user is able to get more details about the engine than a stock instrument panel could ever give. The system even has a fault screen that will let the user know if any faults are detected and provide a code to help troubleshoot the problem. There’s a lot to love about the FiTech EFI Master Kit, like the low cost, the fuel efficiency, the improved engine operation – especially cold engine operation – and it just looks badass under the hood. We may decide to get rid of this old stovebolt engine someday, because let’s face it, even saving four more miles per gallon, 14 mpg is still horrible. However, if we do switch powerplants, we will be keeping the FiTech system for the next one. For more information on FiTech Fuel Injection or their line of products, visit them online at fitechefi.com. For anyone that doesn’t know how to measure fuel mileage without an onboard computer, the old tried and true gas pump method works pretty well. First, fill up your fuel tank. Simply let the pump fill up to the point where it cuts off automatically. Each vehicle has a different amount of head space at the top of the tank, but letting the pump cut off automatically will get very close to the same amount each time. Write down the mileage on your odometer. The next time you fill up, write down how many gallons you used, and the current mileage on the odometer. Subtract the first odometer reading from the second odometer reading to get the number of miles traveled. Divide that number by the number of gallons you used to fill the tank back up, and that is your miles-per-gallon.